EZ Auto Scheduler is a cloud-based appointment scheduling solution for mechanics and the auto industry which allows users to schedule appointments for multiple bays based on the work required. The platform also supports work order generation, automated follow-ups, customer reviews management, credit card processing, and more. With EZ Auto Scheduler, multiple bays can be defined based on their work function such as general maintenance, oil changes, and tire rotation. Several bays and staff members can be scheduled in each available time slot, and tasks can be assigned based on employee skill sets, equipment availability, and other factors. Work orders can also be generated directly from the scheduler. EZ Auto Scheduler’s calendar includes a range of status indicators which provide users with at-a-glance information on appointment statuses. Appointments can be color-coded, and rescheduled using the drag-and-drop interface. A customer database can be created and updated with all service activity. EZ Auto Scheduler also enables automated delivery of service follow-ups to customers to encourage them to return for regular maintenance. Ability to view, track, and manipulate schedule online has been a huge help to our customers. It is also extremely helpful having the ability to quickly and easily update appointment statuses as they happen.-Appointment Status drop-down selection -Appointment email reminders are extremely helpful -Screen navigation and view manipulation -Helpful export feature -Ability to select multiple instructors for a single appointment. Makes meetings schedules much easier. -Appointment Status drop-down selection -Appointment email reminders are extremely helpful -Screen navigation and view manipulation -Helpful export feature -Ability to select multiple instructors for a single appointment. Makes meetings schedules much easier. -Buggy and easy to break. Once broke down the entire server because I accidentally put an end time to occur before the start time. Shut the whole site down. -Can't run any usable reports, such as amounts of time spent by different instructors for specified date range and appointment status. Currently must be counted manually. -Frequent loss of appointments. Disappears for no apparent reasons. Will be scheduled, shows on screen, then few days later or so, customer shows up with hand written appointment card. No appointment on schedule. -Updating customer info has no affect on any existing appointments scheduled for customer. Must update the client in the database, then go and find every occurring scheduled appointment for said customer and update manually. Previous software updated all appointment occurrences with one update. Thank you for your feedback and review. I am sorry you experienced some difficulty with your scheduler. Please help me under what reports you need so we can help you. We can customize any report for you and in many cases we can show you how to run the report you need. A report can be created that will not require manual counting . I will be asking my customer service manager to reach out to you to better understand your concerns so we can correct it for you. Thanks again for your feedback. It is very important to us. Being able to reschedule by email with customers. The price is very good for number of reminder we need to send out per customer. The software is simple to use. I like the email response option for customers to cancel or rescheduled appointment if needed. That feature really cuts down the time when needing to reschedule that appointment and simple to complete by email. It is easy to take a provider off the schedule when needed with minimal time doing so. It is very easy to adjust the schedule as needed as well. Thank you for your review. We can help you with the text reminders displaying the first name and last name of the appointment. There are a few ways we can do this so please contact Scot and we will fix this issue for you. Thanks! Simple and easy to use for our needs. Visually it's super easy to determine what reservations we have, what's available, color code them so I know what is what. Thank you so much for your recent comment about our Eznet Scheduler. We take all positive and negative comments into consideration. We do see a benefit in reading comments from clients who have taken advantage of what our scheduler can do for thier company. In regards to your comment about "alerts," I will be sure to have one of our experts reach out to you regarding this concern. In the mean time, If you know of any company that would benefit from our scheduling system, please share this link www.eznetscheduler.com. Greatest benefit is that I have my schedule available to me on my mobile device anywhere I go and I can make changes or schedule new appointments quickly and easily.I like that this software is cloud based and that any changes from any device are automatically updated. Thank you for your review and feedback.There is a method within the customer database to review appointment history, future appointments and notes. If this is what you are looking for, please reach out to customer service so we can show you how it works. Thanks again for your feedback since we are always working on improving our scheduler and your experience. near perfect productivityeasy to use and train employees on usage, very visual schedule that everyone can see and plan their day accordingly, appointments can be adjusted to real time situations to help keep everyone on schedule. Thank you so much for your recent comment about our Eznet Scheduler. We take pride in our proven system and what it can do for companies like yours. We do see a benefit in reading comments, so thank you and we look forward to your continued commitment to us. We will do the necessary changes. 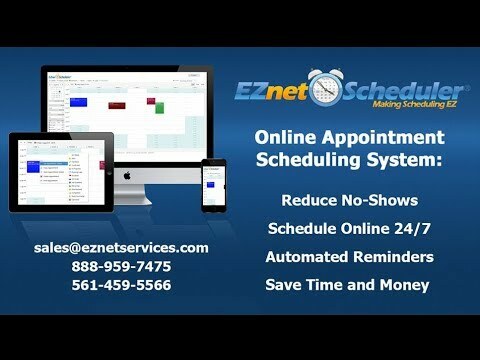 If you know of any company that would benefit from our scheduling system, please share this link www.eznetscheduler.com. Single user: $34.95/month (billed monthly) or $22.87/month (billed annually). Standard: $49.95/month (billed monthly) or $36.62/month (billed annually). Expanded: $59.95/month (billed monthly) or $45.78/month (billed annually). Power user: $69.95/month (billed monthly) or $54.95/month (billed annually). • Bays can be defined based on their work function, such as general maintenance, oil changes, and tire rotation, and multiple bays and staff members can be scheduled in the same time slot. • Tasks can be assigned out based on equipment availability, employee skill sets, and more. • A customer database can be created, maintained, and updated with service activity. • Multiple communication methods are supporting, allowing users to reach out and deliver notifications to their customers by SMS, email, and voice messages. • EZ Auto Scheduler can send out automated service follow-up reminders to encourage clients to return for regular scheduled maintenance. Below are some frequently asked questions for EZ Auto Scheduler. Q. What type of pricing plans does EZ Auto Scheduler offer? Q. Who are the typical users of EZ Auto Scheduler? Q. What languages does EZ Auto Scheduler support? Q. Does EZ Auto Scheduler support mobile devices? Q. Does EZ Auto Scheduler offer an API? No, EZ Auto Scheduler does not have an API available. Q. What other apps does EZ Auto Scheduler integrate with? Q. What level of support does EZ Auto Scheduler offer?